Santa was right on time this year, but unlike last year’s not stop sleigh ride to record heights, this year he left investor stockings with lumps of coal. The major US stock market indices fell 20% on average into the Christmas day low, with a climactic 4 day plunge of 2,500 DOW points on automated computer selling. The rare absence of a Santa Claus rally has many wondering if there is another lump of coal rolling toward investors that may break the recent low or is the worst behind us? The slowing in China, an unresolved Trade War and near recession levels in much of Europe provide plenty of kindling for fear of recession fires in the US. Reviewing the history of some key technical indicators below offers a more sanguine outlook for 2019. We shared some of these market bottoming charts in late December, but the Holiday timing delayed reporting until stocks rebounded sharply. The stock market Volatility Index (VIX) is a very complex measure of out of the money put and call options. Essentially when stocks rally the VIX falls. More importantly, when the stock market corrects sharply, the VIX index spikes higher. While there is no magic number, the upper 20’s and higher on VIX typically signifies an important market bottom is imminent. The 28 level on VIX was last breached the day before the Christmas eve 2018 closing low. These volatility extremes are uncommon and worth taking heed and worth taking on more stocks in the portfolio. The only time these extreme VIX readings in the 30’s and higher are grossly premature occur during severe recessions, such as 2008. Extreme pessimism by the small investor cohort has also been an interesting indication of significant oversold conditions. The American Association of Individual Investors (AAII) Bull minus Bear opinion spread only moves to negative 25 or lower when the market is near an important bottom. The exceptions occur during Bear markets that are associated with economic recessions (2008). While there are legitimate concerns of a minor recession in parts of Europe in early 2019, we don’t see Yellow Flags yet in the US other than below normal growth rates. 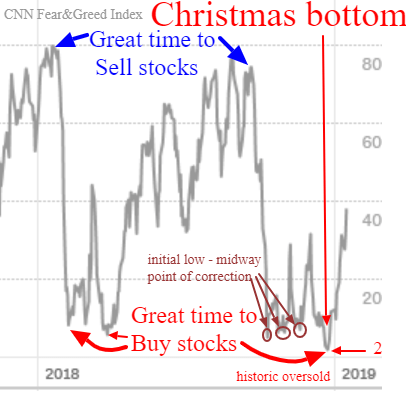 Extreme sentiment conditions can register prematurely, but the track record indicates the mid December level of pessimism was a prudent time to begin investing some dry powder. A more broad based compilation of indicators – such as momentum, volatility, risk spreads, relative strength and sentiment – is contained in CNN’s Fear and Greed Index (money.cnn.com/data/fear-and-greed/). While significant oversold extremes below 10 can be premature, readings of 2 warrant some new investing. The recent extreme was registered right at the lows of the 2018 correction. On the day of THE market low we had another signal of an important bottom. The recent extreme oversold condition doesn’t rule out a retest or modest new low, but implies that significant new market downtrends well below recent lows are unlikely unless there is a serious recession already underway. Finally, we illustrate a similar option sentiment measure that reached pessimistic extremes coincident with the market bottom. The 4 standard deviation put to call option ratio move we targeted occurred the day prior to the Christmas eve closing low in stock indices. The reliability of the indicators we reviewed in this report signaling an area of a longer term market bottom would become more ephemeral if the US were about to plunge into a recession during which most indicator norms are broken. While economists have resolutely stayed with their slower 2019 and no recession until 2020 outlook, we take their forecast with a grain of salt. Studies reveal that accurate prognostications of recession among social science economists isn’t reached until a recession has already arrived. There should be no doubt that significant GDP deterioration in the US will keep the Fed from raising rates and draining reserves, as well as trigger renewed monetary stimulus if needed. China has already been adding stimulus for weeks to forestall slowing and more is on the way. This longer term favorable technical vignette we have painted acknowledges that several unresolved exogenous shocks are lurking. The politically induced climacteric phase related to French riots, Brexit impasse and US – China trade negotiations could have unknowable negative economic consequences if mishandled. At this juncture we look for a January peak, a February higher retest low and further upside into the summer as a 2019 trading range is carved out. The deeper the economic weakness in 2019, the greater the upside potential in 2020 for the economy, earnings and stock prices.